Join Christy Huddleston as she gives up her comfortable lifestyle to teach disadvantaged children in the remote Smoky Mountains. Each of these collections includes three entertaining novels in one volume - Brilliant value! Ages 8-12. Series #3 includes THE PRINCESS CLUB, FAMILY SECRETS and MOUNTAIN MADNESS. 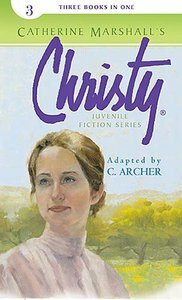 About "Christy Juvenile Fiction Series #03 (3 in 1) (#03 in Christy Juvenile Fiction Series)"
The Princess Club: When Ruby Mae, Bessie, and Clara discover gold in Dead Man's Creek, they form an exclusive group, "The Princess Club." Christy watches in dismay as Cutter Gap is torn apart by greed and envy. Can she find a way to heal the bitter divisions caused by a handful of gold? Family Secrets: Bob Allen and many of the residents of Cutter Gap are upset that a black family has moved into the Cove. When hostile shooting and a series of threatening incidents befall the newly arrived family, the Washingtons, Christy steps in to help. But it's a clue in the Washington's family Bible that may hold the key to real peace and acceptance. Mountain Madness: When Christy travels alone to a nearby mountain, she vows to discover the truth behind the terrifying legend of a strange mountain creature. But what she finds seems worse than anything she could ever have imagined!